It may seem like the school year just ended but it’s already time to start planning for the fall semester. In just a few months, students from across the globe will be leaving home and moving to their new campuses. And what better way to welcome them than with some colorful collegiate banners. Downtown Decorations has worked with over 30 different universities and colleges on banner projects in the past. We have collaborated with schools like Cornell, Texas State, Syracuse, UC San Diego, Virginia, and Texas Tech. 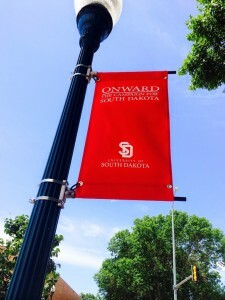 Banners like these can help promote, brand and define a school and its campus. They can be designed to promote celebrations, organizations, sports teams, wayfinding, campus recognition, commencement, etc. Below is an example of a collegiate banner project we worked on with the University of South Dakota just a few weeks ago. We joined forces with the Coyotes back in 2012 and have been producing banners for them since. As you can see in the picture, the simple design mixed with the vibrant color makes for an attractive banner with a ton of pop, adding even more energy to the campus. 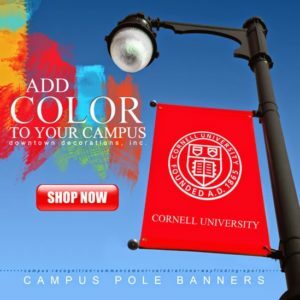 Visit our website to check out some more collegiate banner options and click here to see what some of the schools we've collaborated with had to say about working with us.